I love music; not just J-pop J-rock and whatever other genre you want to stick a J- in front of, but all kinds of music. That said I do like a lot of Japanese bands, and along with many other reasons, they were part of our hook when deciding to take the leap and move over here. As a photographer and film maker I’ve covered a lot of gigs and events back home in the UK, some big, some small, and as you’ve probably guessed from the title, we’ve been to a couple of gigs over here too. 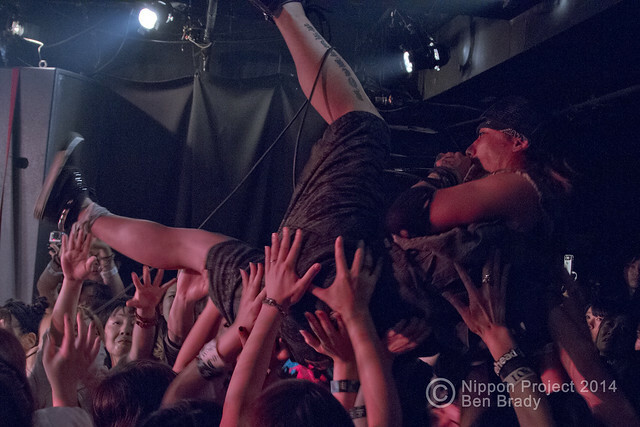 So what can you expect when you come to a gig in Japan? First of all let’s look at some of the general differences, then I’ll talk a bit about different gigs we’ve been to. As I go to more live shows, I’ll update the post. As always, a disclaimer, I’ve not been here long. If there’s something I’ve missed or you think I’m wrong, be sure to pop in a comment. Perhaps it’s just the bands we like but fan clubs are still a big thing in Japan. I’m not going to pretend to know much about them because my Japanese isn’t good enough to look into it, but ticket pre-sales to fan clubs are very common and there’s a good chance some gigs might sell out before you even get a sniff, for example The Gazette are on tour at the moment, and from what we can work out it’s fan club only. How to buy a ticket. Buying tickets for Japanese gigs is incredibly easy and has only one real hurdle. Once you know the date and venue of the live, tickets can usually be bought from a Konbini (Lawson, 7-11 etc.). In the case of all gigs I’ve been to so far, tickets were bought from a Lawson Loppi machine and aside from having to work out the Kanji, it was pretty straight forward. The difficult part was working out how to find ‘L codes'(you can search on the machines, but this can take forever, especially if you can’t read Japanese). These are printed in magazines and sometimes listed on the bands websites. Also some shops sell tickets, and you can buy online but L code is easily the best way to go if one is available. In the case of some smaller venues (there are hundreds in Shibuya alone) you can buy direct I believe. Once you’ve ordered the ticket, you have something like 30 minutes to take the print out to the till. They will ask you to sign to confirm everything, take your money, and then print the ticket out for you. It’s a bit daunting the first time if you can’t read Japanese, but if the Konbini is quiet and you have all of the details you need the staff are usually incredibly helpful. Add 500 yen onto your ticket price. One thing all of the gigs have had in common is a drink charge on the door. I’ve never come across this in the UK, but it basically means that regardless of who you are, and how long ago you bought your ticket, when you actually go into the venue, you have to pay 500 yen, and in exchange you get a free drink from a set menu. Not to bad if they include shots, bit of a gip if you’re tee total. Don’t expect a support act. If there’s nothing listed on the line up, it’s unlikely there will be a support. In the UK, whenever we see a touring band it usually stipulates ‘+special guest’. Now this could be an on-the-up band, or a label mate of the headliner. It could be a local band that the headliner have offered a chance to open to. The point is, there is always something to get your ears used to the volume while waiting around. It’s also a great way to discover something new. In Japan, smaller acts will often team up with a few other bands to hold an event. This way the bands can split the venue cost between them and are more likely to fill a venue up as each artist brings their own supporters. This is how the Loka gig worked, there were about 5 bands playing as part of the event. As acts get bigger, they may hold a special tour (like the Mucc concert we went to) but apparently this is quite unusual. So in the UK we have a few rules regarding professional equipment, but there’s nothing to stop people taking mobile phones and compact cameras into gigs which, depending on your stance means people are free to record their memories, or you’re fed up of seeing a sea of screens while you’re trying to watch someone play. In Japan, whether it’s due to respect or zero tolerance I don’t know, but unless the band themselves say it’s OK you will not see a single camera in the crowd. No camera, mobiles, certainly no iPads (no that really does take the biscuit at a gig, but I’m not here to rant). If you’ve taken pictures at a gig and lived to tell the tale I’d love to hear it in the comments, but after asking around a few friends this is something they are uber-strict on controlling here. Of course, like all rules, sometimes there are exceptions, so in the case of the Loka event they were quite open to the concept of social and played up for their fans. Take a look around and see what everyone else is doing. Gigs in Japan start and finish early. By which I mean a 5pm doors and 8:30pm curfew isn’t unusual. Compare this to the UK’s standard practice of doors 7:30pm curfew 11pm and you can see there’s quite the difference. Some gigs even take place in the daytime, like a matinee theatre show. It’s strange, and it will make getting to shows hard if you have a regular 9-5 job, but hey, ‘shiganai’! On the plus side is does mean you’re unlikely to miss that last train home. Obviously the crowds are going to be very different depending on the type of live you’re attending, like they are in the west. So far I’ve attended three lives. The first was Loka, an on-the-up rock band we covered for Nippon Project. Next was Mucc who are an established J-rock group, and finally Kotoko, an extremely versatile artist who is well known for anisong and game soundtracks. Loka – At Shibuya Milky Way. Japan has a lot of great rock bands. No ‘quirky’ behaviour or costumes, just good straightforward music, and Loka are a great example of this. The Milky Way was a small venue, much like that of the UK ‘toilet tour’ (it felt like a couple of hundred max capacity) and to be quite frank, this gig was pretty much the same as anything you might experience in a similar venue back home. There were around five bands on the bill, each bringing their own fans and all up for a good time. The fans would dance and mosh, some looked grungy, others a bit more dressed up, but what was interesting was that in between each set, people at the front would politely take a step back to allow that other bands fans in and everyone was aware of each other’s personal space. Also like back home, the bands were happy to stand by the merch after their set, pose for photos and give big sweaty hugs to anyone who wanted to congratulate them. The sound and lighting were fantastic, which is something a venue of this size back home might skimp on, and the toilet was a fancy Japanese wash let. Oh, they also had a beer vending machine if you couldn’t be bothered queuing at the bar. Mucc – Shinkiba Studio Coast. So this gig experience was a little different to what I’m use to in the UK. As I mentioned earlier, normally you could expect a band like Mucc to play without support but this is part of a special tour spanning 6 months with different themed gigs so we were lucky to catch SuG (sic) and Merry with them. Studio Coast is around 2,500 capacity venue so if you’re from Leeds, this is around the same as the O2 academy, and if you’re not from Leeds, then it’s the sort of venue a band halfway up the Reading Festival bill might play, someone like Jimmy Eat World or Manic Street Preachers. There were lights, lasers, fantastic sound system, but the crowd were….co-ordinated. Now this wouldn’t seem out of place at something like an AKB48 show or indeed if they were following instructions from the stage, but it was a heavy rock concert. Each song seemed to have set times when you would circle your hands (a bit like our ‘devil horns’ I suppose), certain sections where you would head bang (again, this was all synchronised to perfection) and sections where you would jump up and down. Add to this that Japanese crowds seem capable of keeping time with their actions and clap alongs and you’d be forgiven for thinking everyone had been programmed before coming into the gig. Another eye opener at Mucc was the volume of merch that people seemed to be picking up. Shirts and towels (you see a lot of towels at gigs) cost a little emote than they might with UK bands, but it seemed as if 90% of the audience had bought something, and many of them had bought EVERYTHING. When I started going to gigs a lot in my uni days I’d often buy band shirts, but I have never seen people swarm around a merch stand like they did in Shinkiba. First of all, Kotoko was brilliant and I loved the show, but it was a perfect example of not judging a book by its cover. Whenever you see videos on Youtube for this kind of artist they tend to be nice big venues with lots going on on-stage, and not knowing the area too well I figured Heaven’s Rock must be a reasonable sized place. Looking at their website gives you a list of the AV equipment they use and I’m no expert here but it looked pretty thorough. The venue was tiny, and they had crammed in as many people as possible. The crowd for this show was completely different again, ranging in ages but I’d say 95% men. I would also say at least 80% of them had glow sticks. BIG glow sticks. Some had multiple units. Not the sort you see at a school disco or in your local hyakuen / pound shop either, these things cost in the region of 3,000 yen (roughly £20), are battery operated and can pulse or change colour at the flick of a switch. Again, despite being crammed into the room like a rush hour Yamanote line everybody was very polite and aware of personal space. If people were trying to get out, the crowd would part. There was no surging to get to the front, and despite everyones obvious passion for the gig (I swear there was one guy you could see the veins in his neck every time he cheered, and another guy at the back was calling out her name as if she was his wife, murdered on a stormy night in a TV drama). Joking aside, the glow stick brigade realy do help to get an atmosphere going, and halfway through the set the made interesting ‘voting slips’ when Kotoko offered a choice of classics. When the show started, the stage was lit up like Hull Fair, which would have been great except for the fact it was only about 1ft off the ground. Kotoko is about 4ft 11 according to Google so that explains why I could only see her head whilst on my tip toes (she did climb onto some kind of box at the sides for some of the show though). Once again the crowd were well synchronised. I can’t really describe it in words, but if you watch the video below you’ll get the idea. There was only one exception; a guy who left his glow stick purple when everyone else had there’s green. I’m pretty sure he’ll never live it down. Finally, you might be thinking “Is it possible to enjoy this type of concert if I’m not into the whole synchronised glow stick thing?” and the answer is quite simply yes. Not everybody buys into the actions, and you won’t be judged either way. Not like purple stick guy. That said, one memory I took away from Kotoko was a guy who was there with a group who had glow sticks. He didn’t, and honestly, while everyone else was having a whale of a time, he looked so miserable, as if he’d been conditioned to only enjoy a concert if he could wave his stick around. Occasionally his hands would half heartedly wave with everyone else but it honestly looked like he was having the worst day of his life. So have you been to a concert in Japan? Or have you seen a Japanese artist play in your own country? Who would you like to see perform in your home town? Let us know in the comments. Sitting in India and reading a blog on live gigs in Japan.. Well i must be a great lover of music or am just plain jobless. Anyways .. cool post.